If you ask 10 people about what issues are most important in being ready for marriage, you will get 10 answers. That being said, some issues/questions will come up more frequently. Analyzing your motivations and timing for marriage is definitely worth your time and attention. Author Grace Pamer was nice enough to offer her take on 5 questions you should ask yourself if you are considering marriage (below). I would suggest there are other issues which you already know are key to marriage–things like similar values, discussing whether you want to have children, determining if you have a similar vision for life, and things of this sort. While some couples want to be more settled before marriage (in career, education, financially, etc. ), others are more willing to figure out the journey together. My husband was hoping to have his ideal job before we got engaged, but after five years of dating I was ready for commitment. He decided to take a “leap of faith” as he called it, which paid off when he received an offer for his perfect job while we were on our honeymoon. It’s a sad fact, but today too many people are no longer strangers to the concept of divorce. For some, it could have been their own parents who divorced when they were young. Others may have stood up at a best friend’s wedding, only to see the relationship dissolve a few years later. The point is that dissolution of marriage is not a rare occurrence today – it can leave many individuals questioning if they are truly ready for this commitment, even when deeply in love with their partners. The first step to warming those cold feet is to recognize that getting married has nothing to do with statistics or the relationship health of your friends and family. Being ready for marriage comes down to only one thing – you. It is an inward journey you must take, having nothing to do with the external world or experiences of others. 1. Are You Ready For A Monogamous Relationship? One thing that is expected from marriage is monogamy. Many people don’t commit, at least not until later in life, because they feel they aren’t ready to make such a commitment for the rest of their lives. People who are ready for marriage want a special someone to share their lives with. They don’t view monogamy as a sacrifice – they are happy and secure with the idea of having a perfect lover and a friend, all in one person, until death do they part. 2. Are Large Ambitions And Goals Met? Loving couples can happily endure anything, so this doesn’t imply that life stops once you are married. But if you have a large list of desires you wish to accomplish before saying “I do” it is important to acknowledge that. Examples would be going through medical school, spending a year abroad or any other large time commitment that could start a marriage off on the wrong foot. Again, couples can accomplish any of these things together. But if you have a large list of independent goals you wish to accomplish solo, then take time to be certain now is the right time to be married. 3. Are You Ready For Commitment? Healthy couples aren’t threatened when one partner spends time with other friends and family, as long as time is also devoted to the relationship as well. But being married does involve more time with one person. Never being home, coming home late after your spouse is in bed each night – these things will take a toll. Commitment isn’t a bad word. It is about love and respect for your lover and friend. Building a life together, sharing a home – these are good things with the right person. However, if you find it hard to imagine not being out every evening, spending weekends with friends or being accountable to another person, then this might not be the right time to consider marriage. 4. Do You Feel External Pressure? When you think of marriage, if there is any hint of pressure to say, “I do,” you need to take time and acknowledge that feeling. When considering marriage, pressure can come in many forms. One in particular could be media’s influence, as we are constantly bombarded with marriage proposal stories and news of the latest Hollywood engagement. Your own age might make you feel like a clock is ticking and time is running out. Family or friends might be pressuring you to walk down the aisle. You may have been with your lover a very long time, feeling obligated to move on to the next step. None of the above should be considered reasons to get married. There shouldn’t be any feeling of pressure involved in your decision, only enthusiasm and excitement about marrying your best friend. 5. Is It Based On Love Or Need? The final step in analyzing if you are ready for marriage is the most difficult one – being brutally honest with yourself. Many people get married for the wrong reasons, those reasons being buried deep inside their own personalities and underlying fears. If your self-esteem is low, you fear being alone later in life, seek validation and self-worth from others or cannot stand spending time with just yourself, these issues must be addressed before you can be ready for marriage. A healthy relationship requires two healthy individuals, ones who both contribute to the marriage. Depending on another to validate your worth cannot sustain a relationship over time. Being ready for marriage entails wanting to share your life with someone you love – it isn’t about needing someone to give your life merit. Grace Pamer is a work from home mom and author of Romance Never Dies, which provides a resource for all those seeking romantic ideas and inspiration whether for a date, a marriage proposal or in a long term relationship. As featured in Cosmopolitan.com, CanadianLiving.com, FoxNews.com, YourTango.com and many more. Thanks, Grace, for the guest post. 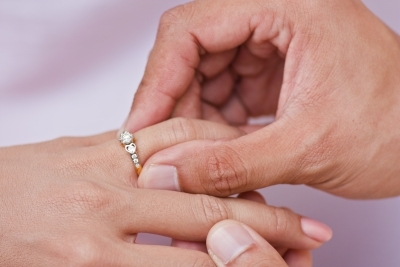 Readers, what question do you feel are most important to ask yourself before getting married? Lori Lowe is the author of First Kiss to Lasting Bliss: Hope & Inspiration for Your Marriage. It tells the inspiring, true stories of couples who used adversity to improve their marriages–from overcoming drug addiction to cancer, infidelity, religious differences, family interference and infertility, among many others. It’s available at Amazon.com and in all e-book formats at www.LoriDLowe.com. Photo by Surachai courtesy of freedigitalphotos.net. Tagged 5 questions before marriage, happy marriage, lifelong marriage, marriage readiness, ready for marriage?, should I get married? Can a math formula offer secret to lasting love? How Does Media Use Affect Your Marriage?